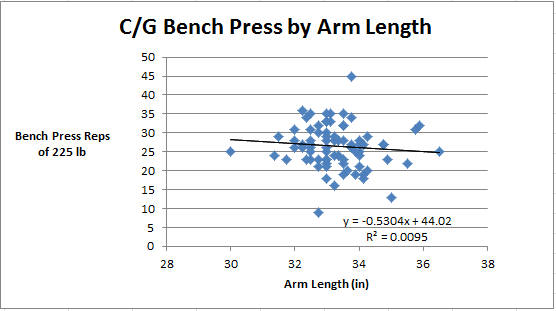 Are long arms bad for bench pressing? Not so fast. 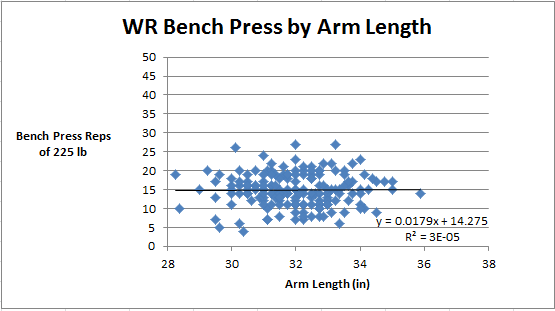 During this year’s NFL Combine, numerous analysts have reported bench press scores alongside arm lengths. 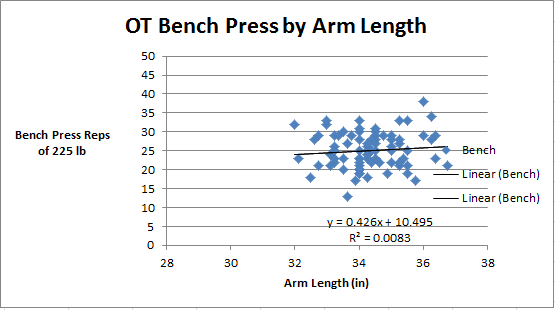 Part of this is that the bench press is the first event after measurements are taken, but another part of it is that many analysts tell us that arm length is important context for interpreting bench press totals. The shorter the players arms, the shorter the bar must travel, the easier each rep is, they say. This idea seems reasonable. Highly respectable NFL evaluators taut it as true, sources outside the NFL report it as true, and it also makes intuitive sense. I was intrigued! How big is the effect? 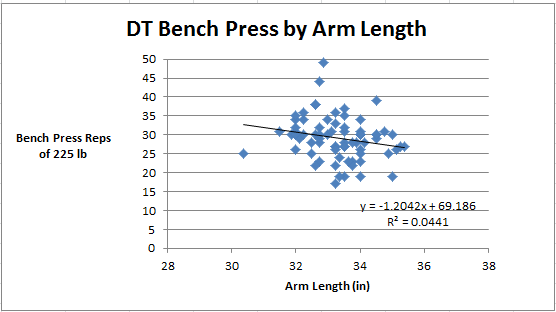 To find out, I used NFL Savant’s player workout data (FOOTNOTE 2) and plotted arm length versus bench press reps for all the positions. 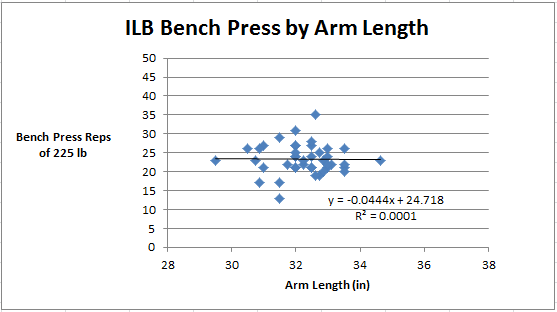 After sorting by posittion, linear regression gives us a line that estimates how much a player should bench based on his arm length. As you can see, there’s not much of a relationship. 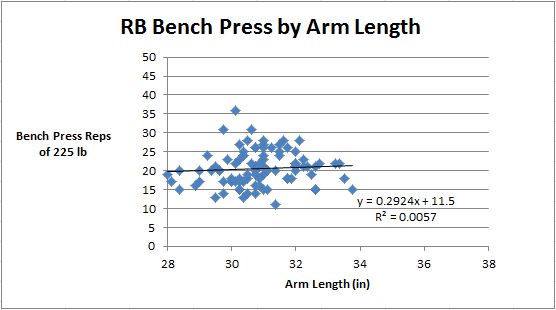 The R^2 values suggest that at no position does arm length explain even 5% of the variation in bench press reps. And the x coefficients on our linear regression lines, which would ideally tell us how many more (or fewer) reps the player should do with each additional inch of arm length, are all quite small as well. 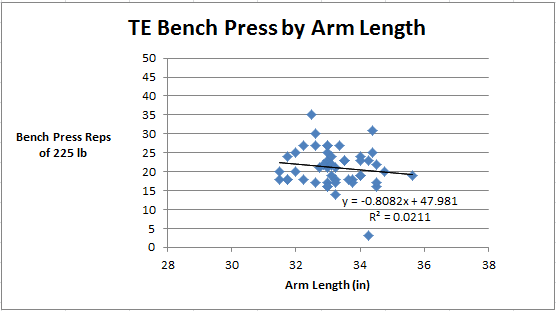 Now, given the small variation in arm sizes (players at each position are generally within 5 inches of every other player at that position), arm length is not a particularly strong or predictor of bench reps. The effect is weak and not even consistent across positions. 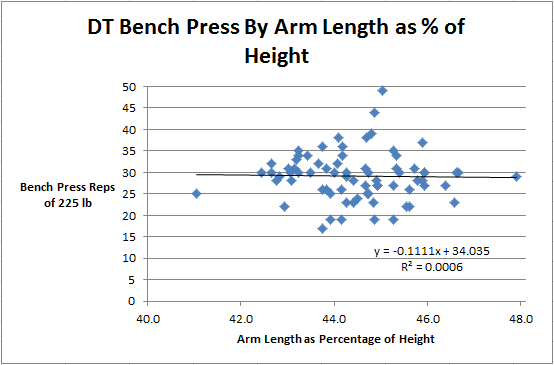 For offensive tackles, history suggests longer arms should actually result in more reps! 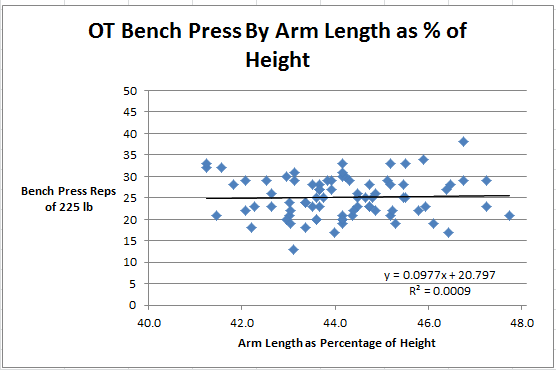 Alas, the long arms equals low bench press reps idea was a myth. But what if by “long arms,” they mean “arms that are long in the sense that they are disproportionately long relative to height”? So I created another set of plots, this time making the x-axis Arm Length as a Percentage of Body Height. But any sort of trend became even weaker. I’d try to analyze this claim, but a Detroit Lions blogger already did it for us! His results actually suggests short-armed players have been better pass blockers. 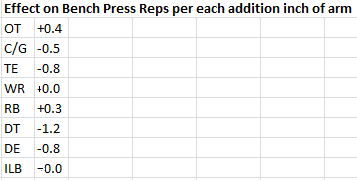 2- a) I call this “workout data” rather than combine data because seemingly all of the online sources of “combine data,” including the one I used (NFL Savant), seem to mix in Pro Day data. But as Danny Tucccito has shown, Pro Day data isn’t perfectly comparable to combine data. b) This particular data set is missing several players. They’re mostly CBs from the 2013 combine. I figured out who they were but didn’t bother to manually add them to my data since this post doesn’t have too much to do with CBs and it just didn’t make sense to go through that work. I have yet to find a flawless online dataset for combine results. Please leave a comment if you know where I can get flawless data! 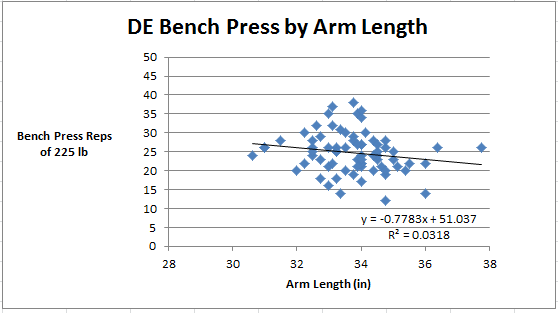 outside of NFL, the notion of arm length affecting bench is in relation to max weight, not reps. There is a large body of research that indicates this to be the case. Thanks for sharing. Can you post some of that research here?